My day off work was filled with coffeecoffeecoffee and lots of 'round-the-house stuff. Just two real meals and some snacking. 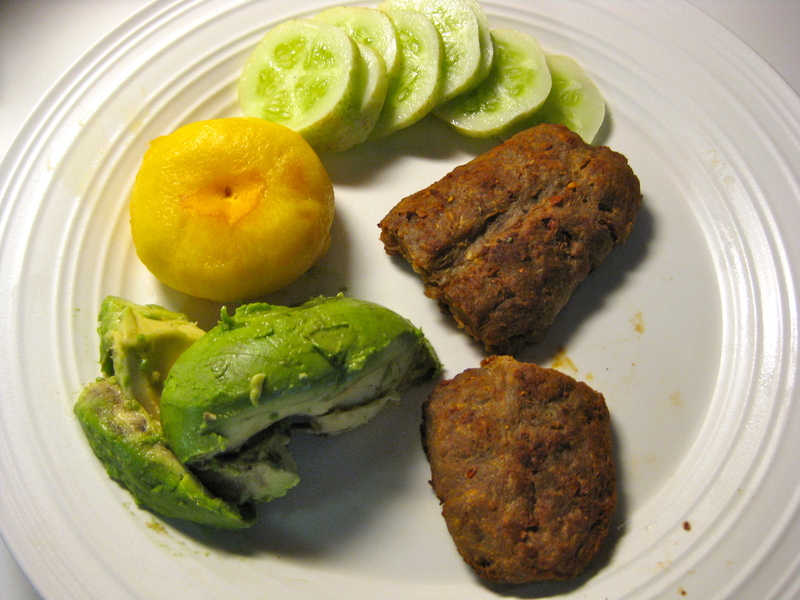 Breakfast: Avocado, a lemon cucumber (so cute!) and a donut peach (even cuter!) from the Headhouse Market in Philadelphia, and sausage. Avocado is so filling and delicious. Lunch: Coffee (anyone ever noticed that coffee can really suppress the appetite?) and a spoonful of Sunbutter in there somewhere. Dinner: Coconut Curry adapted from The Primal Blueprint Cookbook. The few recipes I've made since receiving this cookbook have been well worth its price. Mark's Daily Apple is an amazing resource for Primal living. I infused coconut oil with curry powder, then cooked cubed chicken breast in the oil and set aside. I heated up more coconut oil, added onion and spices like mustard seed, turmeric, cumin, and more curry powder, deglazed the pan to scrape up all the brown bits, then added the chicken back with a can of coconut milk. 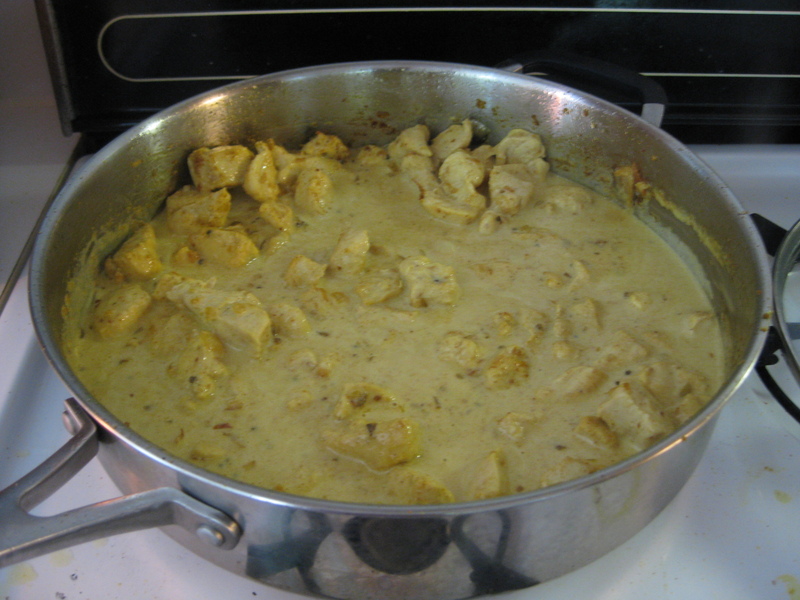 The chicken breast and coconut milk combining with the onion and spices. 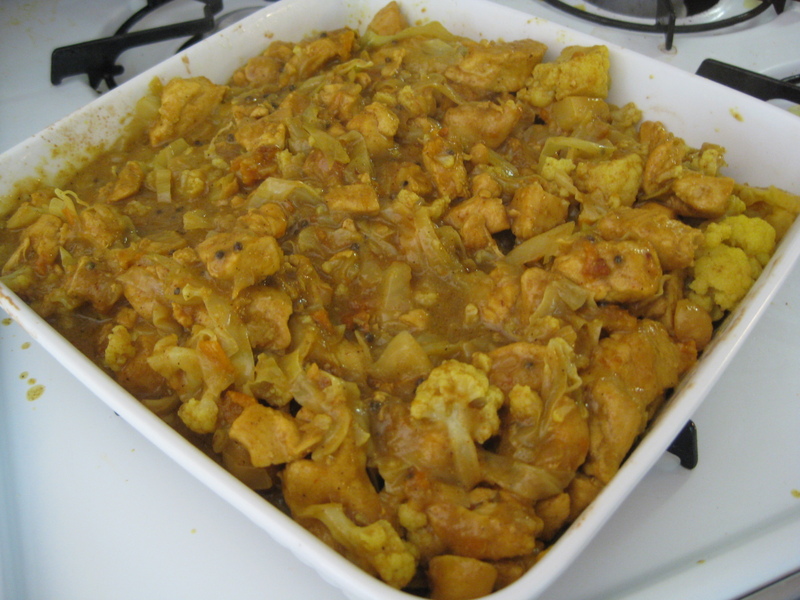 I added chopped cauliflower and cabbage and simmered the whole mix for about 30 minutes. I threw in some Headhouse Market apricots and macadamia nuts at the end as well. Really yummy – though not quite spicy enough. Next time I'll make it much hotter! Today's Workout: Did some work with the Press at Tribe. I've learned that with many movements it takes a solid few sets before the brain starts firing off the “ok, let's do this” signals. I can now press for 3 reps what was my one-rep max a few weeks ago, so I feel that's solid progress. Afterward the Tribe ladies took a leisurely jog around Cooper River – a lovely 3.8 miles at conversation pace. I love my Tribe ladies so much – it's awesome to be part of a community that enjoys doing such active, fun stuff during “social time.” Anyone want to flip a 1,000 lb. tire on their Saturday morning? Sign me up! Sleep: Solid, but not ideal timing. 10PM (late!) to 6AM and had dinner just before bedtime – from my understanding, there's a hormone that's secreted in the first hour or so of sleep that has a powerful effect on things like weight loss and body comp, and if you've got food in immediate circulation, that process doesn't click. It's always a goal to have dinner well before bed. Beyond that, I drank too much coffee yesterday. Back to the one-espresso rule. I’ll have to look for lemon cucumbers and donut peaches. Those lemon cucumbers were the bomb. why didn’t i buy the lemon cucumbers?